Moments after signing coalition deal with Shas, Likud moves to next target to complete gov't: Jewish Home and chairman Naftali Bennett. 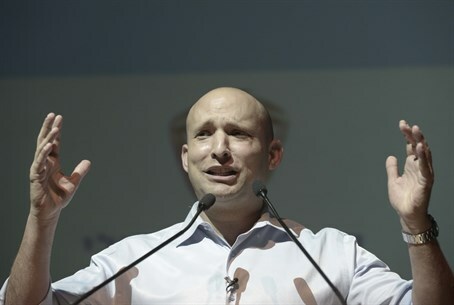 After signing a coalition agreement with Shas, Likud officials stressed that the establishment of a national government rests solely on the shoulders of Jewish Home and its chairman Naftali Bennett. "Prime Minister Binyamin Netanyahu offered the Jewish Home party an unprecedented offer to join a national government under his leadership," Likud said Monday night. The proposal presented to Jewish Home includes the Education and Diaspora Ministries, as well as a Cabinet post, for the party chairman; the Agricultural Ministry and the Settlement Division; the Culture and Sports Ministry including the National Lottery; a Deputy Defense Minister to be responsible for the Civil Administration in Judea and Samaria; and the chairmanship of the Knesset's Constitution, Law and Justice Committee. In addition, the Education Ministry's budget will be significantly increased with hundreds of millions of shekels being allocated to religious Zionist educational institutions and new reforms under the would-be Minister Bennett's auspices. Despite touting the uniqueness of the deal, Likud was quick to make a threat should Jewish Home refuse. "If Jewish Home refuses this proposal, there is just one alternative to a national Likud government: a left-wing government led by [Labor leader Yitzhak] Herzog, which will not have Religious Zionist representation," Likud warned. "A left-wing government that will evacuate settlements, compromise on the status of Jerusalem, hurt the Religious Zionist public, and bend to international pressure." "Likud calls on Jewish Home to join the coalition and sign an agreement tonight, as well on party chairman Naftali Bennett to comply with the will of the national public and its election promises and join the national government without delay," Netanyahu's party said.